"CREATIVE CONVERSATIONS" ART TALKS is a forum/lecture series hosted by curators during gallery exhibitions. The Phantom Gallery will look at how the city influences art, and how the artist transforms the city by contributing to civic dialogue and quality of life. These installations will produce "Creative Conversations" presenting artist speaking about their art. In this exhibit Phantom Gallery Chicago curators Alan Emerson Hicks and Alpha Bruton, invited B. RaEl Ali, and Jelisa M. Davis, who both are resent graduates and emerging Chicago artists to exhibit their art on ?Black- Experimentalism?, each are presenting critical thought and expressing Modernism in their artwork. In their work they have thought critically about black Modernism and what that means. 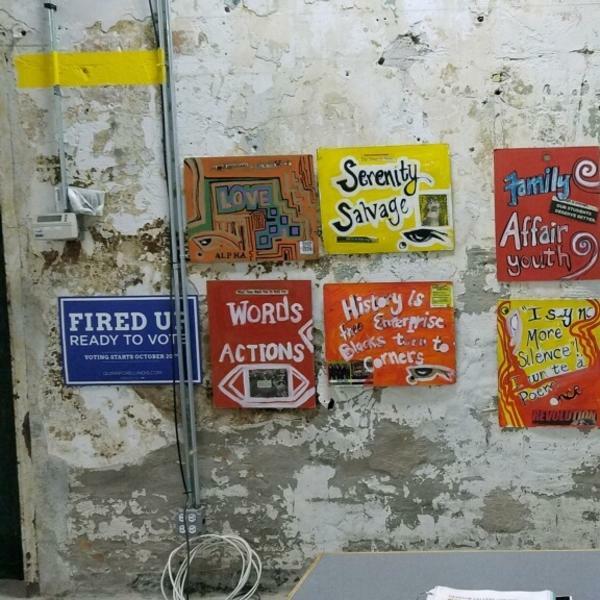 B. Ra-El Ali is an exceptional emerging artist who has exhibited his artwork at Southern Illinois University at Carbondale Illinois, South Side Community Art Center, and he is currently a resident artist and curator at the Hunter International Gallery. Jelisa M. Davis work captures social phobic thoughts, emotions and behaviors prior to or during moments of social interaction. In 2016, Davis graduated from Chicago State University where she studied studio art and developed her enthusiasm for surrealism. Modernism, like its successor, Postmodernism, is neither easily demarcated in terms of actual dates, nor is it easily defined. Much of what describes Modernism also describes Postmodernism. So, what use do we find in the terminology that supposes a distinction? We know, despite this slippage in terminology, however, that Modernism as an artistic movement—embraced by a range of practitioners in literature, music, and the visual arts—is often described as a ?break? from, and a revolt against, Realism. That we engage in a discussion not only about race and gender, but about societal attitudes about race and gender, and the relationship a Modernism that cannot be extracted from these attitudes and a black Modernism that emerged alongside and against them. I want to think about poets whose work we might not consider experimental and see how the innovations in that work begin to shift the ground beneath what we think of as ?black experimental.? INTO ACTION! is a groundbreaking social justice festival of art and ideas.